Check out your attitude and expectations first. Actually, over the years I have learned that the most profitable thing to do first is examine is my own attitude and expectations. Am I giving this child enough help and attention, or am I more focused on other tasks I want to accomplish during school time? Am I short-tempered or critical because I’m in a hurry or unhappy about being “interrupted, again?” Do I have too many other activities and commitments to be able to focus on my children and their education? (Ouch!) If this makes you wince, pray for yourself and your child(ren), and ask God to give you insight and wisdom into this situation. Believe me, He will do it. 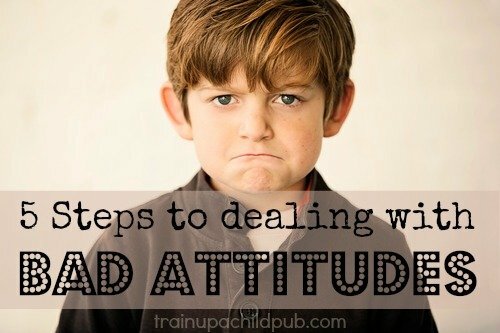 Ask calmly about the bad attitude and listen with focused attention. Secondly, talk with your child calmly about his attitude, and really listen to what he says. Is she hungry? Tired? Lonely? Overwhelmed? Sometimes there is a physical or psychological reason that can easily be dealt with by a snack and/or a little focused attention. If it involves more than that, at least you will convey to your child that he is more important to you than the completion of his grammar lesson. Determine if it is a character issue. Thirdly, determine if this is a character issue. If it is, it’s critical to identify and take steps to remedy the problem. God’s Word is very clear on the issues of anger and rebellion, and I believe the heart condition of a child is more important than his math facts. Teach Scripture and train in righteousness. Have him memorize pertinent verses and hold him, your other children, and yourself, to a standard of kind and cheerful speech. Teach and reteach that “obedience” is the following: when you give an instruction, a child looks you in the eye and says “Yes, ma’am,” (I’m living in South Carolina) or “Yes, Mom,” and then immediately begins the task. As well, this is a prudent time to get the principal involved. Whether Dad helps with academics or not, it’s critical for him to be aware, involved, and supportive of your goals and struggles with each of your students.Your children need to know they will answer to Dad for a poor attitude or negligent work. One of the systems we’ve had in place in our home during the ‘younger years’ to facilitate communication is a weekly “Presentation Night.” Children have the opportunity to share what they’ve learned that week and present reports, and Dad has a chance to praise and encourage, as well as peruse any test papers and ask about any substandard work. Lastly, use positive motivation and incentive. Try to catch your student doing something positive, such as working quietly, completing an assignment independently or quickly, speaking kindly, or having a helpful attitude with a sibling. When those occasions occur, we generally make do with a warm hug and verbal recognition, but you may want to take it to the next level. A system of tally marks or stickers per incidence with a “store” of small items, where those tallies can be redeemed at the end of the week, may work well with your child. With realistic expectations, a calm, organized and attentive mom, consistent training and good modeling, you should be able to see improvement in your child’s attitude. And if you are anything like me, you might even grow a bit in the process.